Ms B is staying. And that's the final decision- no more waffling or questioning myself. 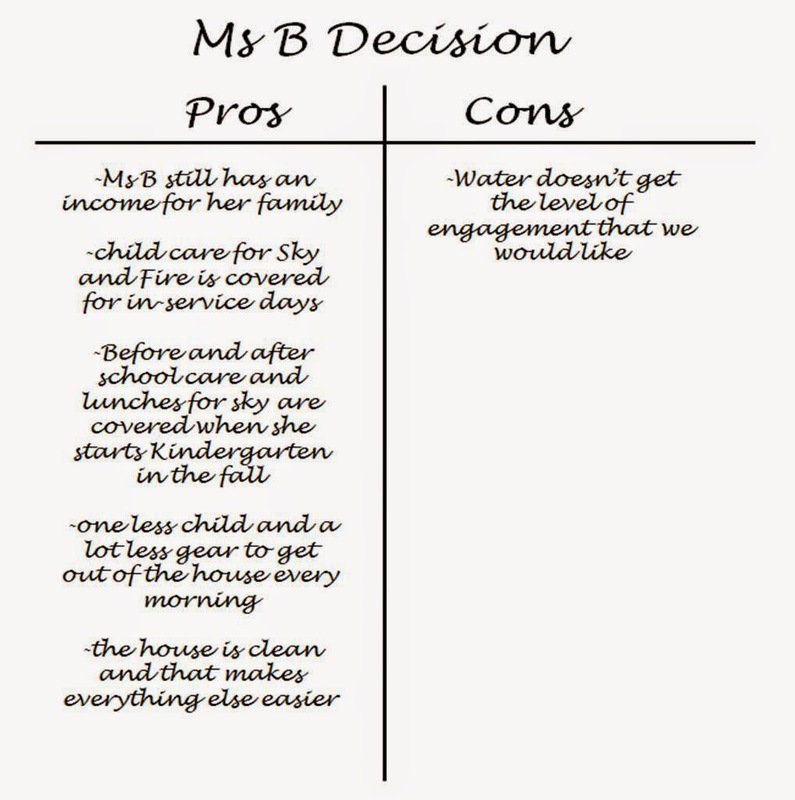 If you've read this blog before, you know that Ms B is Water's nanny and our housekeeper and that I have been trying to decide if we should continue to have her work for us or if we should move Water to the same daycare that Sky and Fire attend. I posted about it several times (here and here) and solicited advice from practically everyone. D and I have fought over it and it's kept me up at night. In the end, I had to make the decision that was best for everyone, not just for Water, and that means that Ms B is staying. I know that many people would disagree with the decision- to tell the truth, I don't like it myself- but I do feel that it's the right decision for us. What finally convinced me? Obviously the pro side is much longer than the con side. Add that to the fact that Water isn't suffering at all during the time he spends with Ms B - he's clean, fed, and happy, just not getting the extra stimulation he would get at the CDC- and my decision was made for me. I chose what was best for everyone. Being in a family means making sacrifices and while I don't like it, one of those sacrifices is accepting good enough care at home for Water. These decisions are hard, that's for sure. You're my type of lady though... making up a pros and cons list! Thanks Jennifer. I wish it were different but for us right now, it just makes sense to have help around the house. And yes, I did actually have a paper list- until I saw all the reasons side by side, I couldn't commit to the decision. I remember when you first posted this dilemma. Sounds like you made the right decision for everyone! But still a hard decision, nonetheless. Hope you had a wonderful weekend. Thanks for linking up again with us at H54F! There are still things I hate about this decision but it still feels like the right one for our family. Thanks for hosting the link party and stopping by!